Print and EFile 1099 INT & Other W2 / 1099 Forms. Prints on preprinted 1099-INT & other 1099 forms. Prints 1099 INT, 1099-MISC, 1099-DIV, 1099-R & W2 Forms Copies to blank paper. Meets IRS & SSA regulations. Exports IRS 1099 INT forms & W2 /1099 forms to Excel. Unlimited W2, 1099 & 1099 INT recipients / payers. Available for 2018 (filing in 2019), 2017 & before. Create 1099-INT, MISC, DIV, R & W2 in minutes. 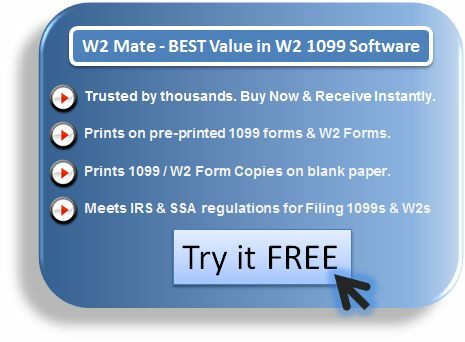 W2 Mate is a powerful W2 / 1099 software that supports a number of forms other than 1099-INT. This page is dedicated to 1099-INT, to read about the full capabilities of W2 Mate click here . Start printing now...Order our 1099-INT Software and receive instantly! All these form 1099-INT copies can be printed on blank paper with black ink. Laser Copy A of form 1099 INT: For Internal Revenue Service Center. Support for an unlimited number of 1099-INT Filers and unlimited number of employees and 1099-INT recipients, unlike other W2 and 1099 INT software applications! Exports 1099 INT data to Excel format. For a detailed description of this IRS 1099-INT software and its features, please visit our 1099 tax software page. Box 1. Interest Income : Use this 1099-INT box to enter interest not included in box 3. Include amounts of $10 or more, whether or not designated as interest, that are paid or credited to the person's account by savings and loan associations, mutual savings banks not having capital stock represented by shares, building and loan associations, cooperative banks, homestead associations, credit unions, or similar organizations. Box 2. Early Withdrawal Penalty: According to 1099-int instructions you need to enter interest or principal forfeited because of an early withdrawal of time deposits, such as an early withdrawal from a certificate of deposit (CD), that is deductible from gross income by the recipient. Box 3. Interest on U.S. Savings Bonds and Treas. Obligations: Use our 1099-INT software to enter interest on U.S. Savings Bonds, Treasury bills, Treasury notes, and Treasury bonds. Do not include in box 1. Box 4. Federal Income Tax Withheld: Enter backup withholding. For example, if a recipient does not furnish its TIN to you in the manner required, you must backup withhold at a 28% rate on payments required to be reported in box 1 (which may be reduced by the amount reported in box 2), box 3, and box 8 on this form. This 1099-INT software provides an exact replica of the original IRS 1099-INT form (you can easily locate Box 4 and other 1099-INT fields inside our software). Box 5. Investment Expenses: For single-class REMICs only. Box 6. Foreign Tax Paid: Please use a 1099-INT software to enter any foreign tax withheld and paid on interest. Report this amount in U.S. dollars. Box 7. Foreign Country or U.S. Possession: Enter the name of the foreign country or U.S. possession to which the withheld tax applies. Box 8. Tax-Exempt Interest: Enter interest of $10 or more that is credited or paid to the person's account if that interest is used to finance government operations and is issued by a state, the District of Columbia, a U.S. possession, an Indian tribal government, or a political subdivision. Form 1099-INT Box 9. Specified Private Activity Bond Interest: Enter interest of $10 or more of interest from specified private activity bonds. Ready to print and E-file 1099 INT forms? Download a free demo of our 1099 INT software now , enter actual recipients and see for yourself how easy and powerful this software is.